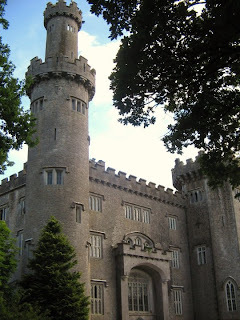 The castle is situated in Ireland's most ancient primordial oak woods, once the haunting grounds of Ireland's druids. In the 6th century it was part of the ancient monastic site of Lynally, which itself was in the ancient Durrow monastic settlement. By the mid-fifteen hundreds, the lands that were originally ruled by the O'Moore clan were securely "planted". From this point on a dynasty was established which endured into the late nineteenth century. Charleville Castle grew from paper doodles in early 1798 to grandiose plans by the end of that very eventful year in Ireland. It was built by Charles William Bury, Earl of Charleville. It was designed by Francis Johnston, who also designed the GPO in Dublin, one of the leading architects of the day. It owes its "Tin Soldier Fortress" look to the celebration of victory over the third French revolutionary expedition to Ireland - the first decisive victory by Britain over the revolutionary republican movement, which was sweeping across the monarchies and their colonies at that time. It took fourteen years to complete this gothic dream, a monument not only to a now forgotten power, but also to the people who made it possible, the Irish craftsmen and impoverished people. The castle had to be temporarily closed at times, due to the castle owners living beyond their means. However, each subsequent re-opening was usually marked by a suitably flamboyant gesture, which included engaging the talents of William Morris, who designed the ceiling within the dining room. Additionally, Charleville is said to have helped start a craze of building castles within Ireland. The castle played host to Lord Byron, who held many parties here. In fact, whenever he visited Ireland he always went to the castle. This was due to the castle owner's eccentricity. The castle remained uninhabited from 1912, during the difficult years of the independence war and the long years of economic severity which followed. By 1968 the roof had been removed. It had become a part of "Vanishing Ireland" until finally work on its restoration was commenced by Michael McMullen in 1971 and later by Constance Heavey Seaquist and Bonnie Vance. A Charitable Trust has been formed to help with the restoration. The land that the castle was built on was originally an ancient monastery and/or a sacred Druid site, depending on whose history you read, but either way that was over a thousand years ago. Whether any of the ghosts stem from that time period is debatable. There are fiendish rumors that the first Earl of Charleville practiced devil worship, others that he had the building erected on the site of ancient ley lines in order to take advantage of the natural magnetic energies prevalent there. Freemasonry was a family tradition with the Burys. Could that have anything to do with the plethora of ghostly phenomenon reported at their family home? Who can say? 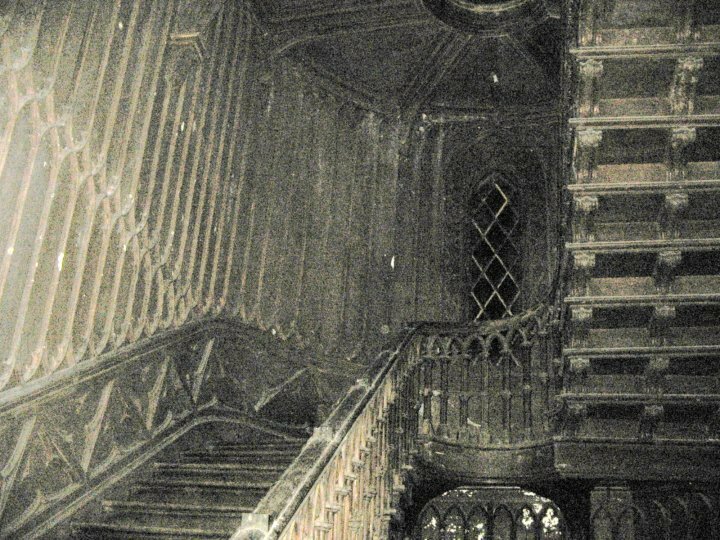 The most famous ghost of Charleville Castle is perhaps its most tragic, due to the tender age of the child Harriet, the golden haired daughter of one of the Earls of Charleville, was sliding playfully down the banister of the grand staircase when she lost her balance and fell to her death on the cold stone floor below. Many visitors have sensed movement of cold air when traversing the stairway. Others have seen the child on the steps, as well as throughout the rest of the house, often seemingly playing a spectral game of hide and seek. Occasionally she is spotted with a small boy for her playmate, but who he is no one knows. The two are suspected culprits in an incident where a daughter of the house was inexplicably locked in a cupboard in the playroom. A kinder and more famous tale linked with this pair of child ghosts revolves around the small son of Bridget Vance, who purchased and started to renovate the castle in the 1970′s. Her son came up missing one day when he was a wee three year old. Frantically the family searched the castle for him, terrified that he might fall from the stairs or one of the galleries. They finally found him at the bottom of the staircase where he told them that a boy and girl had looked after him as he came down the steps. Ms. Vance’s mother awoke one night in her tower bedroom to witness what she called a “cavalcade” of ghosts, including a large number of robed, monk-like figures who seemed to encircle her bed and offer her a blessing. A guest of Ms. Vance had bedded down in a spare room after a party, but was kept awake by a boisterous conversation held by two unseen Englishmen of another age. Disconcerted by the invisible interlopers, he finally was able to get some rest after turning the lights back on and keeping the door to the room open. Other reports from this active castle include voices, footsteps, a child’s cry, a white mist and an eerie male figure who roams the walkways of the castle. There is a balcony that is kept locked due to it being the territory of a powerful elemental which, depending on which account you read, is either a nature spirit or a collection of spirits that have been assimilated into one being, like the Borg on Star Trek. The castle owner was reportedly warned by a sensitive that the elemental was not a good spirit and would not hesitate to do harm to intruders on its balcony. Taking caution to heart, the owner has kept the balcony locked ever since. 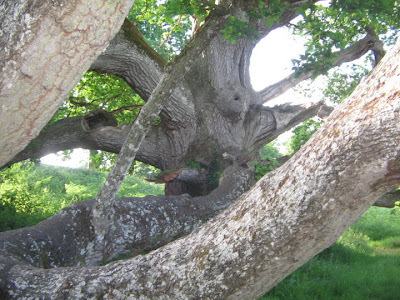 Finally, one of the legends of Charleville Castle is that of the “King Oak”, a huge, ancient tree that had a special relationship to the Bury family. It was said that if one of the branches fell from the tree, a member of the family would pass away shortly. In 1963 the oak was hit by a devastating lightning strike. The tree managed to survive, but within a matter of days Colonel Charles Howard-Bury, the head of the Bury family and last of the family to own the castle, died unexpectedly. The castle has been subject of many investigations notably Most Haunted, Ghost Hunters International and Scariest Places On Earth. who have all visited there to carry out a televised investigation. Since 2009 Charleville has been investigated by Haunted Earth on two occasions. A great deal of activity was captured including EVP and orb related anomalies. On the first visit Haunted Earth experienced the phenomenon of a door being slammed by unknown forces which is a feature of this location. Undoubtedly, the most famous ghost which haunts a staircase is believed to be that of a young Bury family member named Harriet who died tragically while playing in the stairwell many years ago. Her apparition has been seen in the stairwell and people have also felt a cold spot brushing past them as they descend the steps. The castle was built on land that was once an ancient druid burial ground. Hooded figures have been seen by members of the Vance family. Haunted Earth left recording equipment in Harriet`s nursery which lies at the top of the stairs and a whole host of EVP was captured including that of a young girl we believe was Harriet. Her voice said, `Do you love me?`. Here below is a special clip released just prior to the first investigation. 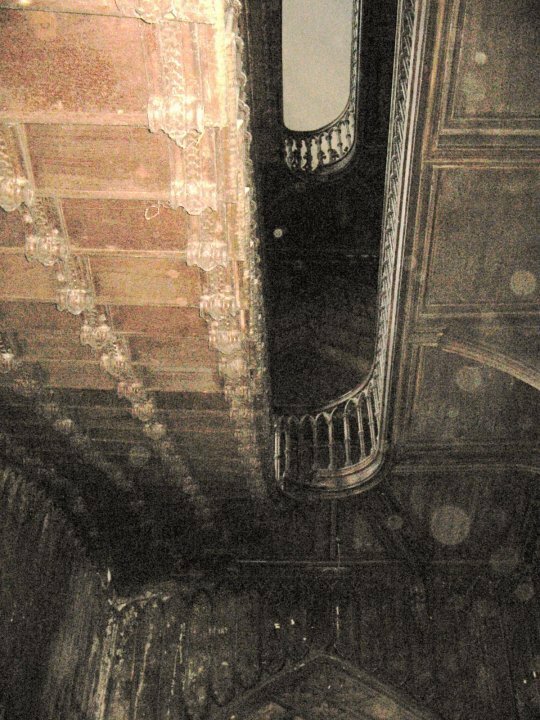 Haunted Earth subsequently returned to Charleville Forest Castle in 2010 and carried out a further investigation which provided more EVP of this most fascinating and haunted building. WHITNEY HOUSTON - ANOTHER CELEBRITY GHOST? GHOST CAUGHT ON CAMERA AT KINGSGATE CASTLE? CAN HUMANS SEE WITHOUT THE POWER OF EYESIGHT? DO HUMANS HAVE THE POWER OF PREMONITION?